Chronic itching, flaking and redness are collectively known as dandruff. While it can be embarrassing, this skin condition isn't serious. Treatment of such conditions can be difficult, but there are plenty of options to choose from. 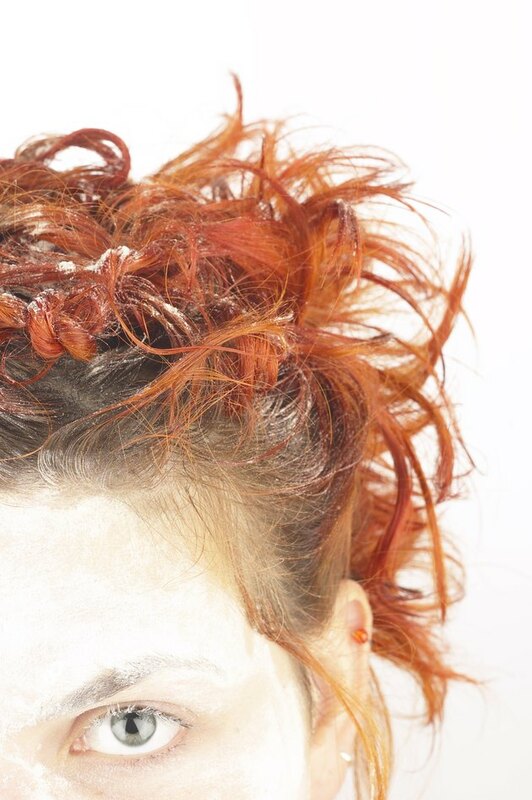 Color-treated hair may fade or bleed with the use of many commercial dandruff products. Some natural products are milder and leave the color treatment intact while helping to ease the symptoms of dandruff. Wet your hair and scalp. Using a cotton ball or brush, apply a generous amount of tea tree oil to the scalp and roots of the hair. Do not apply so much that the oil is dripping off of your head. Lift sections of long or thick hair to allow ample access to all areas affected by dandruff. Place a shower cap over the head. Allow the treatment to set for 30 minutes, or overnight when possible. Shampoo the hair in the morning with a mild cleanser. Be sure to massage the scalp gently but do not use your fingernails. Breaking the skin or irritating the scalp further will only prolong the symptoms of dandruff. Rinse the shampoo from the hair. Apply a hydrating or mild condition to the hair. Be sure to rinse the product well, as buildup of products can compound the flaking. Dry and style hair as you normally would. Try to avoid products full of fragrance or alcohol, as these are irritating to the scalp.